Dhaka, Dec 31 (Just News): Prime Minister Sheikh Hasina on Sunday sought public mandate again for Awami League in the next general elections saying it was the only political party in the country which could take forward Bangladeshin all fronts. ‘The Awami League is the only party which has a vision to move forward the country in all areas of development and the party has proved it when it came to power,’ she told a mammoth public rally at the Jessore Eidgah maidan in this western district. Sheikh Hasina added that, on the contrary, the country ‘goes back like the ‘ghost’ when BNP-Jammat comes to power’. Sheikh Hasina arrived in Jessore earlier today on a day-long visit. ‘You have given vote for ‘boat’ (AL election symbol). In future you will also cast your vote for the candidates of ‘boat’, ensuring their victory to create scope to serve the people, and I expect this from you,’ she said while thousands of people raised their two hands in a gesture of support to her call. AL presidium member Pijush Kanti Bhatacharya, joint secretaries Dipu Moni, Mahbubul Alam Hanif, Kazi Nabil Ahmed, MP also spoke in the meeting chaired by Awami League’s district unit president Shahidul Islam Milon. The prime minister said people could achieve the expected prosperity as Awami League remains in power and Bangladesh could celebrate the golden jubilee of its independence in 2021 discarding its image as a poor country. Sheikh Hasina said Bangladesh was liberated with a goal of becoming a happy and prosperous nation but over 27 years the anti-liberation forces reigned the country in its 46 years history, ruining the nation’s development, peace and prosperity. She said In the name of multi-party democracy they rehabilitated the anti-liberation force who never wanted the country’s welfare. ‘People have got taste of development only when Awami League was in office while BNP plundered public wealth when they ruled the country and killed people in arson attack when they were in opposition,’ the prime minister said. The prime minister said Awami League fought for liberating the country under the leadership of the Father of the Nation for 23 years. Awami League has united the people for war of Liberation and brought freedom for the people. 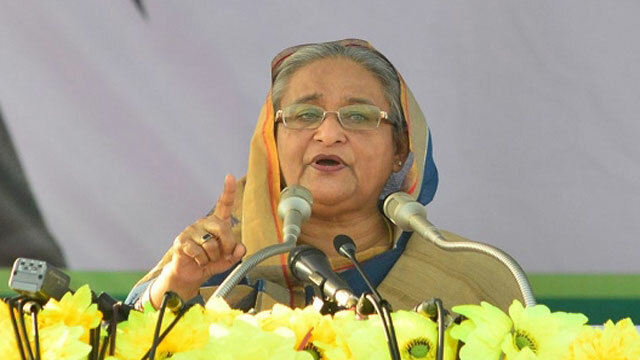 ‘Inshallah, Bangladesh, led by the Awami League, would be able to reach the country to its cherished goal and settle it in a dignified position in the world,’ she said.